You answer questions; I do the work. Then together, we plan. I use proven and proprietary analytical tools to first highlight cash issues, improve selling efforts and/or address any personnel challenge. These tools allow me to accurately predict cash, for instance, so you will know where you will be twelve months from today. Our time tools helps make time for the important. We can try to find time, but we never do. We have to make time for what’s important, not find it. That’s why I created our proprietary time planner to allow us to help you make time for what’s important the easy way. Our way of increasing sales starts with “do what you can without selling.” Then, if we need even more sales, we can help you find something specific to sell as well as help train on selling the easy way. Specifically it involves a Selling Plan, another proprietary tool developed by CPrint. I start with an initial in-depth Business Review via the Internet which saves travel expenses as well as time for you. All the while I work specifically with your staff, your equipment and your market. Day one is to gather information and day two is reporting findings to you and then planning what to do. My first task is “putting myself in your shoes” and gathering facts. No snap judgments here. Once I have the facts, then I move to solutions. Remember, it is the identification of the problem that is most of the solution. No matter what your needs – increasing cash, increasing sales, training workers or preparing for retirement, there is only one resource that can do it all. That’s us. CPrint International. Fill in the form below and we will contact you for a no-cost or obligation review. Then you can see if the 2 Day Challenge is right for you. You may also email me direct at: tom@cprint.com or call my cell (304) 541-3714. Let’s start a conversation. 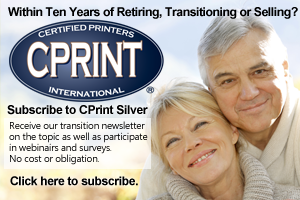 CPrint Newsletter at no cost or obligation!